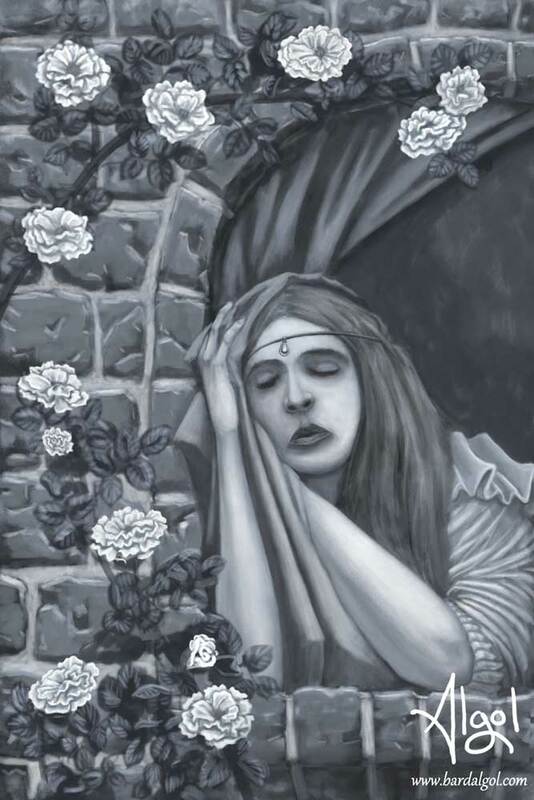 The idea was “a girl sleeping among some roses”. Instead of simply laying on a bed or in a field, I placed her in a castle window. We don’t know if she’s imprisoned in a lonely tower like Rapunzel or simply in her bedroom window waiting for someone. It’s possible the tear shaped jewel in her headband and partially covering her face with the curtain represents a bit of sadness. I added some decorative ruffles and straps on her gown to connect her with the climbing roses in the scene. This image is currently unpublished and is available for licensing without the signature watermark. Please use the Contact Form if you are interested in use.